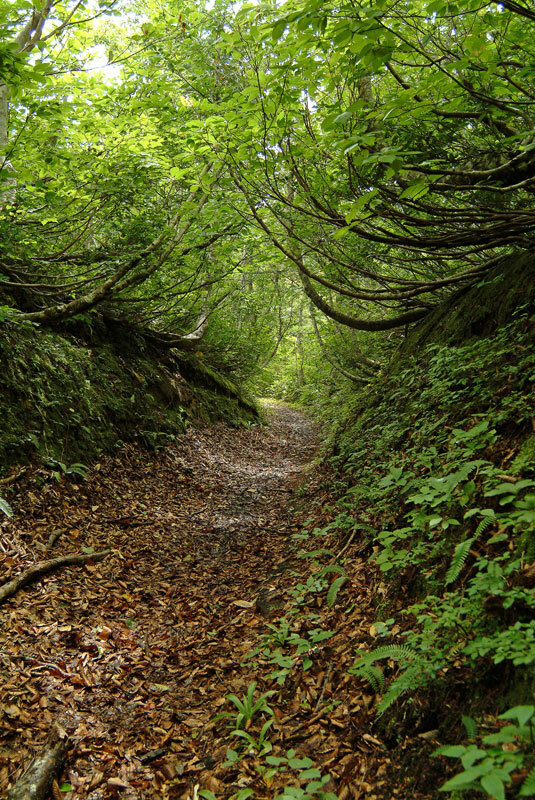 Rokujurigoe Road, which connects the Shonai Region to the inland, is said to have been opened 1,200 years ago. 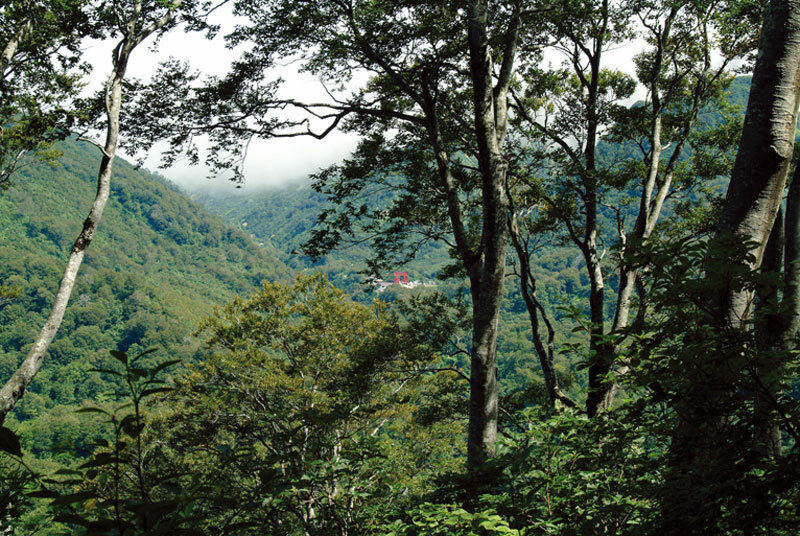 It was a rugged mountain route running from Tsuruoka through Jyuotouge , Oami, Sainokamitoge, and Tamugimata to pass over Ogukidoge, then on to Shizu, Hondoji, and Sagae to arrive in Yamagata. It was a well-worn road that saw numerous pilgrims and travelers come and go, but retreated from center stage when a new road was opened in the late 1890s to early 1900s. Even today, there are many historic remains along the route lying beneath the moss that speak of that time. 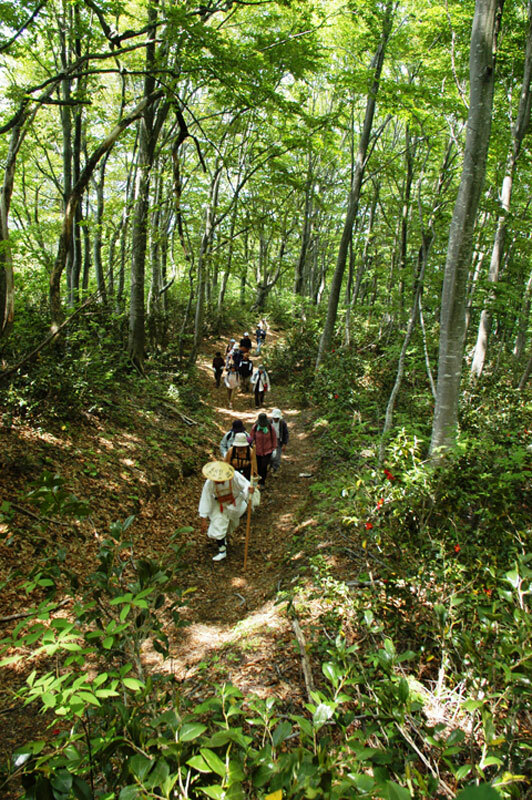 During the Muromachi and Edo periods when mountain worship was at its height, the road was busy with pilgrims (worshippers) who came from various parts of the Tohoku and Kanto regions to visit Mt. Yudono. Records also show that during the Warring States Period the route was trod by military horses, and in the feudal government period it was utilized by daimyo traveling to and from the capital. Other travelers included people from Shonai who carried loads of fishes and candles on their backs, and travelers from inland who carried safflower, silk floss, beans, and tobacco leaves. This is the entrance to Mt. Yudono. The great teacher Kobo Daishi is enshrined beneath the ancient trees. 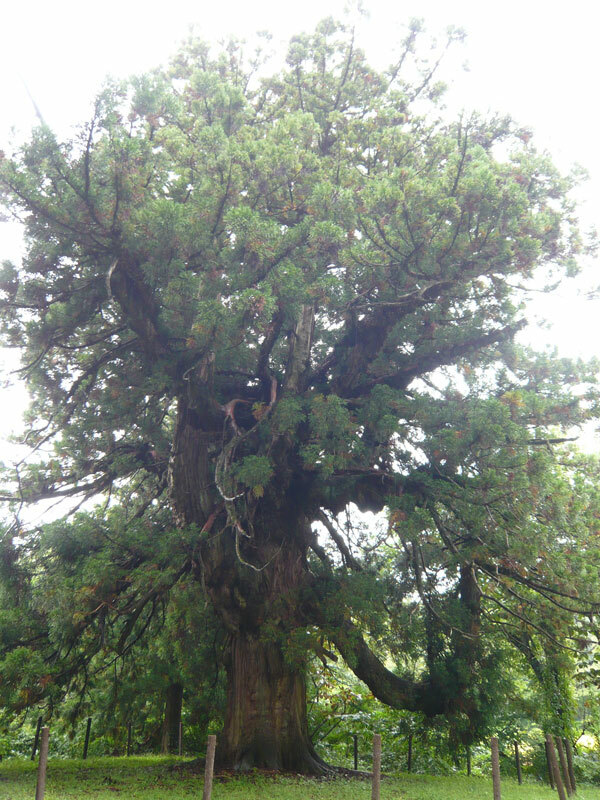 At the base of a pine tree stands a stone monument of “Shomen Kongo Doji” that watches over safe travels. This was a forked road. In the Shonai Domain, Oami and Matsune along Rokujurigoe Road were appointed relay stations. There were always packhorses, laborers, palanquins and the like at hand for transporting goods for public business or regular travelers. A statue of the Dainichi Buddha and the sokushinbutsu (living Buddha), Saint Honmyokai are enshrined here. Of the 6 sokushinbutsu that exist in the Shonai Region, he is the oldest and in the best condition. 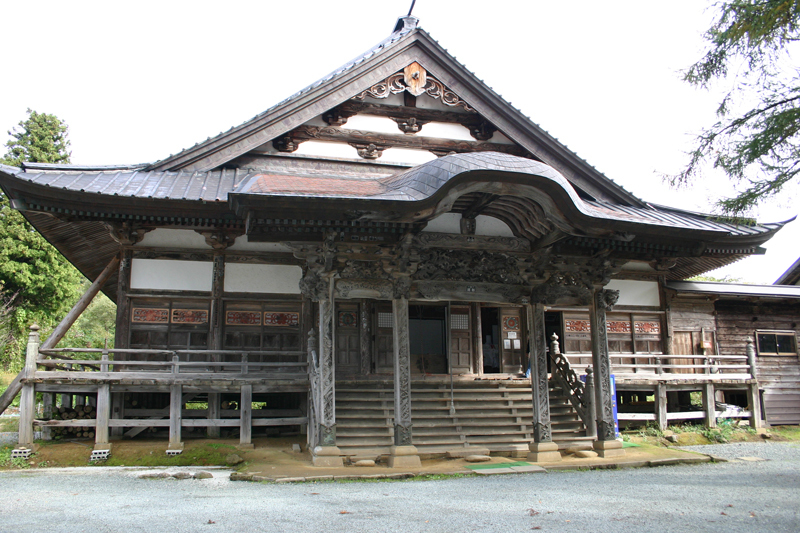 In accordance with Saint Honmyokai’s petition, it is said that the feudal lord, Sakai provided aid, and after acquiring a temple territory of 70 koku the main building and sokushinbutsu hall were newly constructed to restore the temple to the prosperity that existed when the mountain was opened. 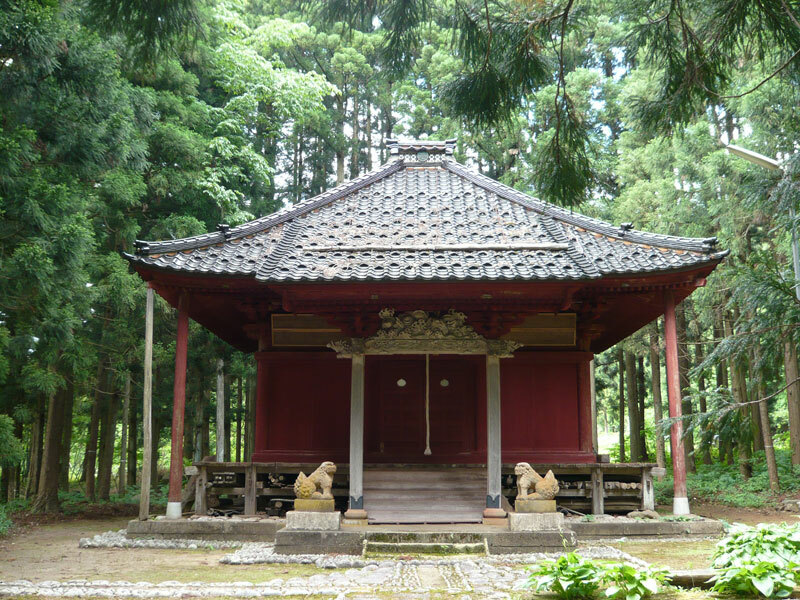 This temple is said to have been established by Kobo Daishi Kukai. In 833, Kukai built a fire altar beneath the cherry blossom trees where he continued to pray for 49 days. Hachidai doji (eight great youths) appeared and led him to a shintai (sacred object) on Mt. Yudono. Kukai hung shime rope (used to cordon off consecrated areas; written in the same kanji letters to spell Churen) from the cherry blossom branches and named the temple, Churen. He also named the mountain, Yudono. The temple is famous for appearing in Atsushi Mori’s novel, “Mt. Gassan.” Saint Tetsumonkai’s mummified body is enshrined here. Within the grounds, there are shimekake-zakura that bloom around the beginning of May each year. Legend says that in the year of the ox, the year Mt. Yudono was opened, sacred Shinto straw festoons appear by themselves. This temple is one of the most sacred places in Tohoku. It enshrines a statue of Dainichi Buddha, the sokushinbutsu (living Buddha), Saint Shinnyokai, and a golden standing statue of Shaka Nyorai (national important cultural property). It is said that Iemitsu Tokugawa’s wet nurse, Lady Kasuga prayed here at Dainichibo to petition for him to become the third Shogun of the Tokugawa family. She presented the Dainichi Buddha and rebuilt the temple. 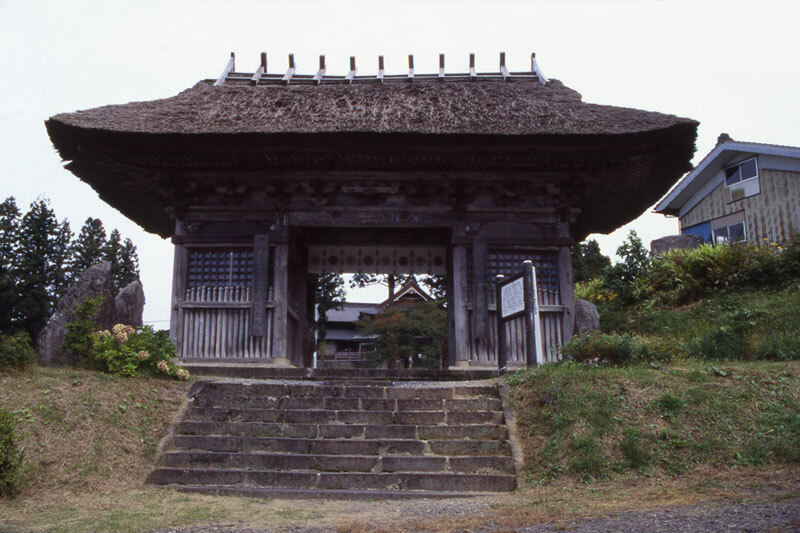 Dainichibo was chosen as one of the 7 temples in Japan designated for shogunate families. This tower stands 4m high and is approximately 2m wide, and is said to be the largest in Tohoku. “Koshin” refers to a day in the 57th term of the Chinese astrological calendar made possible through the combination of the lunar calendar and the sexagenary cycle. On the eve of koshin, religious associations gather at an appointed home, and after singing songs such as the “koshin sowaka,” they talk through the night. The tower was constructed to commemorate these gatherings. This cedar tree stands 27m tall. 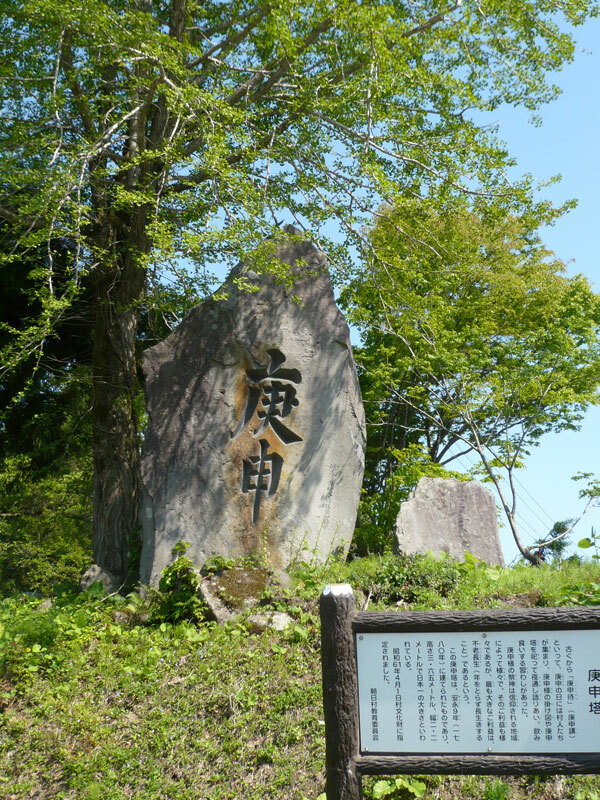 Emperor Keiko’s son, Prince left the capital to pacify Tohoku, but died here. The tree is said to have been named after the fact that it was planted on the gravesite. It is also said that when Kobo Daishi delivered the monjushuri bosatsu, the shimekake he threw to indicate this is a sacred spot became caught in the tree. This is a prefecturally designated natural monument. This beautiful, multi-level home, featuring a unique construction born from living in a snowy climate and narrow valley, still remains standing today. Tamugimata was an important stopping point along Rokujurigoe Road and was a village of inns where many travelers stayed. During the Edo Period, 7 or 8 of the approximately 30 homes were inns, and the lights at the lodging houses never went out. This spot along the road is well known for its spectacular autumn colors. Among the Japanese beech trees are colonies of snow camellia that envelope the area in flowers in spring. This is a popular walking course where trekkers enjoy the refreshing green leaves of the beech trees in summer, and the colors in the autumn as the fallen leaves form a cushion beneath the feet. A milestone once stood here. As is spelled out by the Japanese kanji letters, this road went through the mountain and was approximately 2m across. Locals call it Kohonogi and Ohonogi. The beech trees form a tunnel, and throughout the four seasons create a canopy over your head. In spring, the canopy is of new leaves, in fall the canopy becomes colorful as the autumn leaves turn, and in the summer the leaves protect walkers from the strong summer sun. It presents the perfect shade and instills an inexplicable comfort. This is the only place along the road that has a view of the large, red torii gate in front of the sanrojo (place where priests retire alone to pray ) on Mt. Yudono and the shintai (sacred object) of Mt. Yudono far in the distance. Locally, it has been called the ogamisho (place to worship something from afar）. People are said to have worshipped from here when too much snow made it difficult to reach the main shrine or they could not make the trek to worship for other reasons. On this land sacred to the Mt. Yudono faith, travelers who aspired to become sokushinbutsu underwent harsh ascetic practices that included giving up grains. 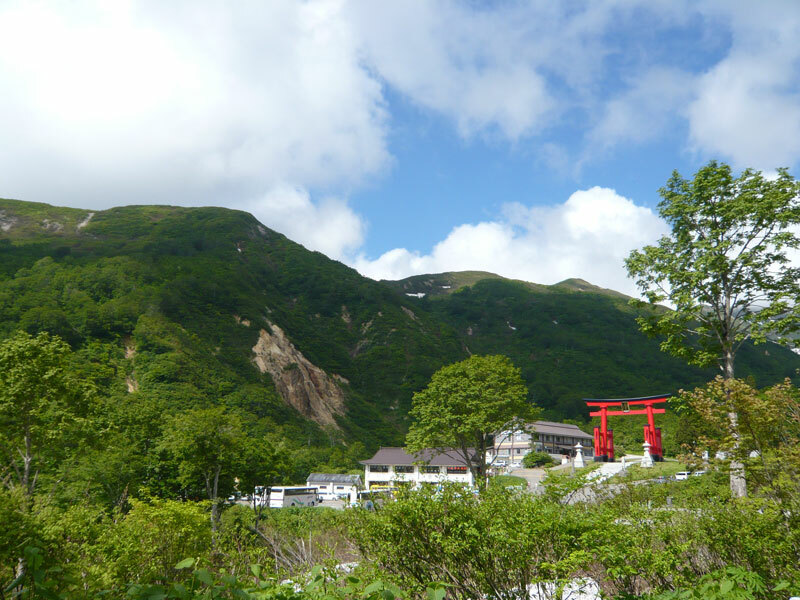 It is said that devotees constructed Yudonosanhi (Mt. 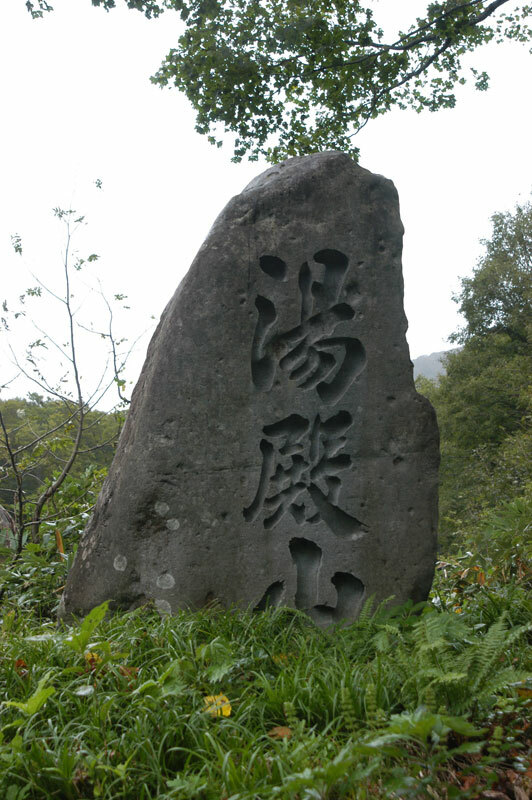 Yudono stone monument) in praise of the travelers after they had completed 1,000 to 5,000 days of training. This large stone monument constructed in 1881 stands on the bank of a mountain river and speaks of times past. This shrine stands 1,504m above sea level, halfway up hills that stretch to Mt. Gassan. It is called the innermost temple of Dewa Sanzan. There is no shrine building. The shintai (sacred object) of Mt. Yudono is a giant, mysterious rock from which hot spring water bubbles out. In the old days, people likened the sacred object to the mystery of a woman giving birth to life, and long prayed to it for abundant harvests and the prosperity of their descendants.